Brownies are one of those things that are perfect all year round and, most of the time, they can be customised to suit the occasion! If you've been here a while, you'll know that I did some Easter brownies earlier this year, Christmas tree-shaped brownies in December and some vampire-themed brownies last Halloween, but I'm back again with another spooky spin on my go to recipe. 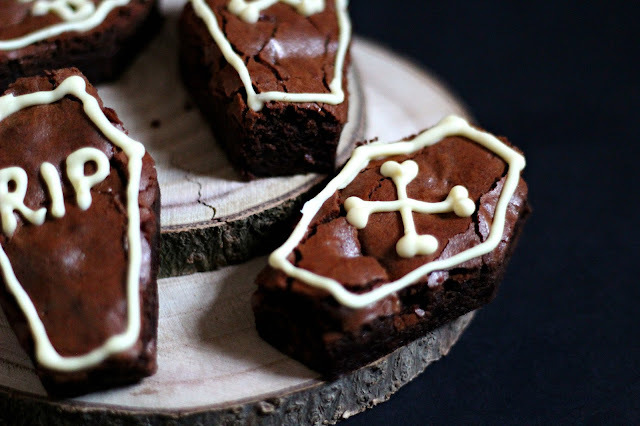 These are my bone box brownies (I just had to get that alliteration in there) and they're absolutely gorgeous! I don't want to blow my own trumpet too hard, but I took these into work and my manager said that it was the best brownie he's ever had, and he doesn't even like brownies that much! They're super easy to make and the taste is to die for. If you know me, you'll know that I have a bit of a habit of spotting things in supermarkets and just buying them with the hopes that I'll use them one day. That's exactly what happens every time I see a Terry's chocolate orange! I know for a fact that if I don't bake with one, I'll end up eating it, but for these brownies, I decided to use the one that I had stashed away. As the old advert for the chocolate says, I didn't tap it, I 'whacked' it into lots of chunks that got mixed into the batter before baking, so instead of the usual milk and white chocolate chips in every bite, you get a chunk of delicious, chocolate orangey goodness. I didn't just stop there though! To ramp up the chocolate orange flavour even more, I switched out the two tablespoons of black coffee that I normally use in this recipe for the juice of one orange. The coffee helps to keep the brownies gorgeously moist whilst also giving the chocolate a deeper, richer taste. I figured that by switching it for orange juice, I would still get that gooeyness, but also just a hint of orange. Of course, there's more than two tablespoons of juice in an orange, so I also altered the quantity of flour so that the brownies could still hold themselves up. This does make them a little less gooey than the original recipe, but they still have that moistness. To get the 'bone box' shape for each of these brownies, I used a cookie cutter from a set that I bought in Homesense (that shop has made an appearance in every baking post so far this month) and I cut them out before the brownie slab had fully set. 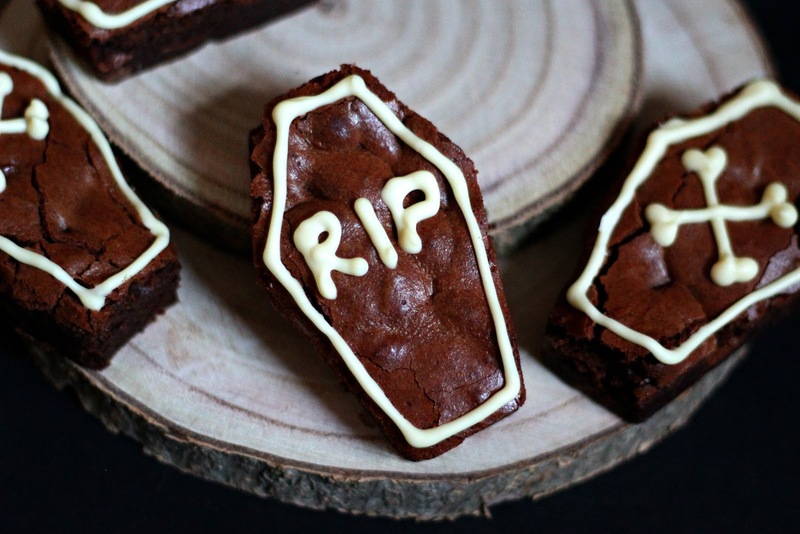 Obviously, coffin cookie cutters aren't widely available, but you still get the shape by using a knife and cutting round a paper template, or just cutting out the shape from memory. 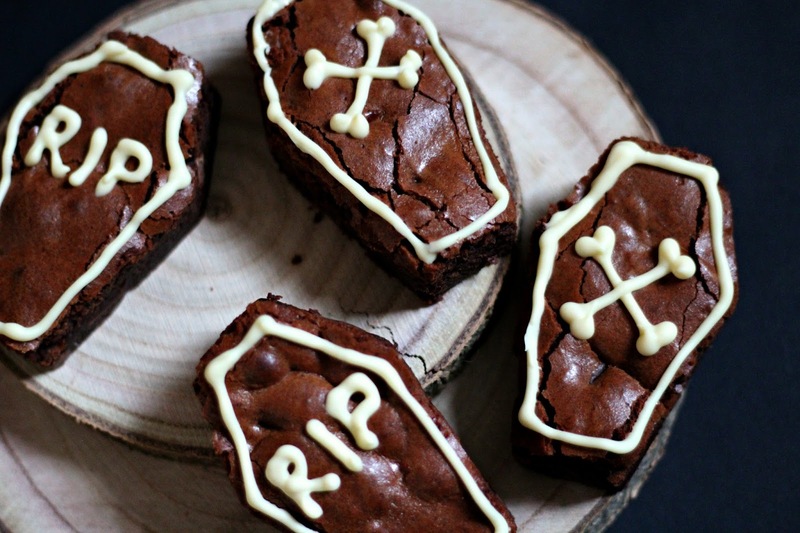 Or if you just want a batch of chocolate orange non-Halloween brownies, then simply cut them into bars! If you do that, then the white chocolate is optional, but all I did to achieve the finished look was melt the white chocolate, spoon it into a freezer bag, snip off a tiny bit of the corner and pipe away. Easy peasy! Preheat your oven to 180c/gas mark 5. Grease and line a 18 x 28cm/7 x 11" tin with greaseproof paper. I recommend using a tin as close to these measurements as possible, otherwise it may take a longer or shorter amount of time for your brownies to bake. Break the plain chocolate into squares and place in a heatproof bowl with the butter. Using the microwave, melt them down, stirring at intervals until they are completely combined. You can also do this by setting the bowl over a pan of simmering water. Remove the bowl and leave the mixture to cool for 5 minutes. In a separate bowl, beat the eggs, sugar, zest and juice together until smooth, then gradually beat in the cooled melted chocolate mixture. Sift the flour and salt over the mixture, then fold in together with the chunks of chocolate orange and the vanilla extract. Spoon the mixture into the prepared tin, spreading it out evenly, and then bake for about 35 minutes or just until firm to the touch. If you are using a tin that is close to the original measurements, don't bake it for any longer, as it will still be soft under the crust but will firm up as it cools. If your tin is larger or smaller, you may have to adjust your timings accordingly. Leave the brownie slab to cool in the tin for around 30-45 minutes before removing it. Trim the crusty edges, then, using a cookie cutter or a knife, cut your brownies into coffin shapes and leave them to one side to fully cool. Break your white chocolate into a heatproof bowl and microwave at 20 second intervals, being sure to stir in between and taking care not to burn it, until it has fully melted. You can also melt your chocolate over a pan of barely simmering water, if you'd prefer! Allow the chocolate to cool slightly, then spoon it into a piping bag or a freezer bag. Snip a tiny portion of the corner off and squeeze to pipe on your design. I went for a simple outline, then RIP or crossed bones. Leave them to fully set before eating. I think I'm going to have to make another batch of these guys before the month is out because I'm just head over heels for them! Something that I totally forgot to point out in my little intro chat is that if you're cutting these into coffin shapes, you're going to be left with a heck of a lot of cut offs, which make a great snack, if you know what I'm saying! But in all seriousness, these brownies are absolutely beautiful and would be an ideal treat for this season. 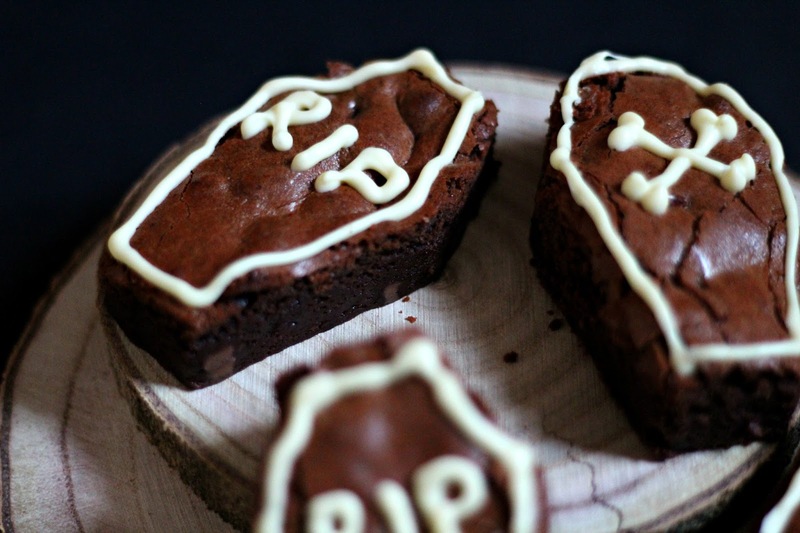 I could just imagine these at a Halloween party or as a sharing snack in the office. They are utterly TO DIE FOR.